Dangar is yet another Thanjavur Maharastrian (TM) recipe. 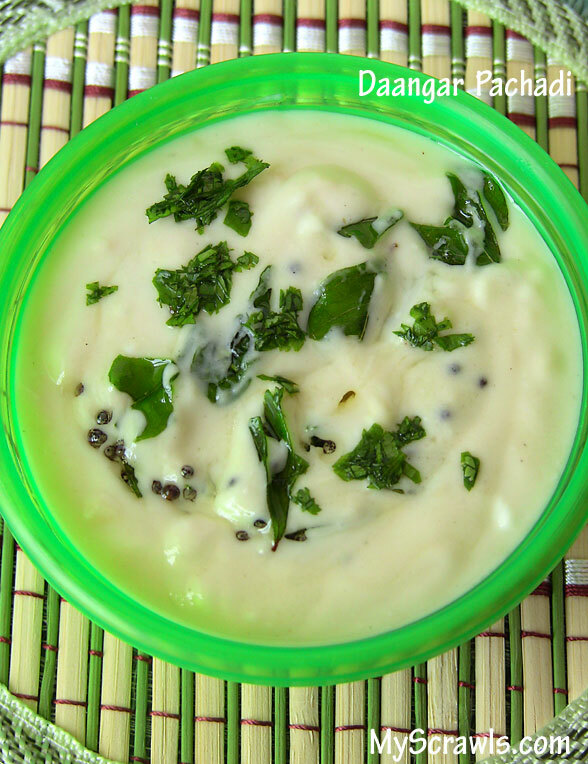 Dangar is a variety of raita/pachadi that is prepared using urad flour. This dish is very famous in traditional TM household. Before I give the recipe, let me admit that dangar comes under the “acquired taste” category. Not all like to eat gooey urad paste I’m not a great fan of this but DH loves to have dangar with spicy sambar/pitlai! I had always thought that Dangar is known within TM community alone. I was surprised to hear its name in a famous wedding (kalayana padal) song. It’s a wonderful song describing all the dishes that would served in a lavish Hindu wedding ceremony. Do Not listen to this song when u are hungry! Mix urad flour with water (as required) and make thick paste. Ensure there are no lumps. Add yoghurt and salt with urad paste and blend thoroughly. Heat oil and do seasoning with mustard seeds, hing and curry leaves. Add it to the yoghurt mixture. Daangar pachadi goes well with sambar/kootu and kuzhambu varieties. I remember eating this long long ago in some relatives house as a side for Mandi-sambar bhaat . You are absolutely right about the “acquired taste” category! Thanks Gayathri! Yeah daangar goes well with mandi sambar bath. Dont know why everytime I hear the name “mandi sambar bath” I drool lol!